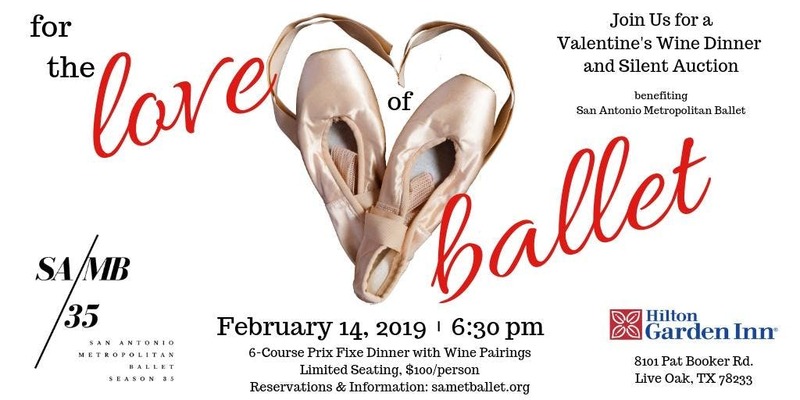 San Antonio Metropolitan Ballet is excited to host its first Wine Pairing Dinner on Valentine's Day in partnership with Phoenix Hospitality Group, the management company for the Hilton Garden Inn and Southern Glazier's Fine Wine Suppliers. Chef Rachael Potts has planned a Valentine's Day inspired dinner featuring a uniquely designed six-course menu with specially selected wines rating 87 points and above by Wine Spectator. In addition to the event's silent auction, FIFTY PERCENT of your ticket directly benefits San Antonio Metropolitan Ballet and its educational programs. Wines will be available for purchase at a special rate with a portion of the proceeds benefiting SAMB's programming. Seating is limited - make your reservation today!